In a small saucepan, cover the chicken with cold water and bring to a simmer. Poach the chicken gently till barely done through, about 10 minutes, you don't want it to be rubbery, and it will continue to cook in the oven. Drain, and when cool enough to handle, cut in large rustic chunks. Melt the butter in the bottom of a heavy bottomed pot. Saute the shallot and leek for a few minutes until they start to soften. Add the mushrooms and continue sauteing for 5 more minutes over medium heat. Sprinkle in the flour and cook for a couple of minutes, stirring constantly. Pour in the sherry and let it bubble away for a minute or so, still stirring. Add the hot stock and bring back to a simmer, stirring constantly. Add the chicken to the thickened stock, and the salt and pepper to taste. Let the pot simmer gently for a couple of minutes and then add the fresh thyme leaves and the frozen peas. Pour into a deep dish pie plate or a casserole and set aside while you roll out the crust. Roll out the crust on a floured board and cut into strips. 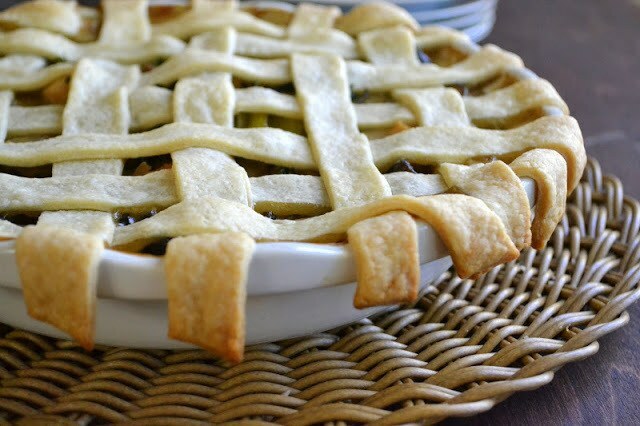 Weave the strips across the pie, interlacing them as best you can...don't make yourself crazy. Bake the pie for about 40-45 minutes until the crust is golden and the filling is bubbling. Be sure to lay a sheet of foil under the pie to catch any filling that might bubble out.